Get a little creative with your chicken and asparagus! Pound chicken breasts thin and cut into long strips. Clean and dry asparagus cutting off ends. 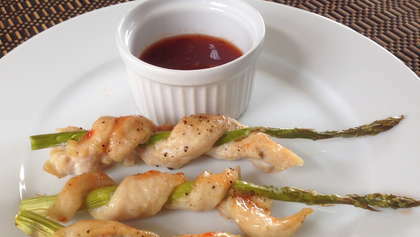 Using a toothpick, secure chicken strip near top of asparagus. Wrap chicken strip around asparagus spear and secure at the bottom with another toothpick. Place "snakes" on a baking tray and brush with olive oil. Sprinkle with light coating of salt, pepper and garlic powder. Bake for 17-19 minutes until chicken is soft but no longer pink. Carefully remove toothpicks and transfer to a serving platter. Brush a thin layer of chili sauce on each chicken piece. Serve the remaining sauce in a small container for dipping. Makes 15 to 20 pieces.